After nearly thirty years representing Canada in seven different countries (Canada as well as, in order, Philippines, Thailand, Vietnam, US, Afghanistan (Ingrid only) and, from 2009-12, Sri Lanka, where Bruce was High Commissioner and Ingrid was Country Director for World University Services of Canada), the prospect of a return to offices in Ottawa was enough to make us agree that it might be a good time to try something, as they say, completely different. We had always thought that the best part of our respective jobs over the years was meeting a constant stream of new people; the worst part was the sometimes quite overwhelming "stuffed shirt" character of international diplomacy. The challenge then was to find an activity that would allow us to continue to cross paths with the widest swath of interesting people but in the most informal of settings. From that basic premise, it was a small leap to the idea of a Bed and Breakfast. The name, El Diplomatico Feo, (The Ugly Diplomat) is a gentle joke on ourselves. To those who ask, "why Spain", our simple answer is, "why not?" It is a fabulous country with a hugely colourful history and a people who seem, to these experienced travellers anyway, amongst the most naturally friendly we have ever met. Add to that the fact that it is one of the world's leading tourist destinations and, finally, that we found our particular paradise in Cadiz Province, one kilometre from a town that boasts of 330 days of sunshine per year and, well, is any further explanation necessary? The municipality of Jimena de la Frontera includes San Pablo de Buceite, Los Angeles (Estacion Jimena) and San Martin de Tesorillo. Jimena has been deemed to be of historical and artistic interest by the Junta de Andalucia and the whole area, known as "Campo de Gibraltar", has been traversed through the centuries by, among others, pre-historic cave dwellers, Iberians, Phoenicians, Romans, Visigoths and Muslims. Jimena was at one time a well-established Roman city, Oba, which printed its own coinage. Stones with Roman inscriptions can be found in the town today. It's wealth was based on agricultural cultivation between the Guadiaro and Hozgarganta rivers. Ximena is in fact an Arabic name and dates to the period of struggle between Christians and Muslims that formed a border or frontier ("frontera") that shifted between the two religions. The heydays of its Islamic castle were during the 13th-15th centuries although its origins were much earlier. Today, the castle at the top of the town and an 18th century armament factory are open to public viewing. There are also numerous prehistoric paintings in various sites near the town. Historically, San Pablo and San Martin were owned by two families. The Duke of Medina Sidonia came from an old aristocratic family and was amply rewarded by the King of Spain in the 15th century, becoming one of the largest landowners in the south. He sold to the Marques de Larios in 1869. Larios is best known today as the name of a Spanish gin but in its time it was more diversified. In 1887, Buceite, the Arabic name for "land of olives" became San Pablo de Buceite, a rural colony that permitted locals to avoid both taxes and joining the military! Two Larios sons, Pablo and Martin, are the origin of the names of San Pablo and San Martin. Let's be clear. We will totally understand if you want to do little else during your stay but sit in a Canadian Muskoka chair and soak up El Diplomatico Feo's sunshine and scenic splendour. After all, we do it all the time. The large swimming pool bordered by oleanders and bougainvilleas and walks among our fruit trees or adjoining meadow might easily be all the recreation you need. Venture beyond our boundaries, however, and discover why Cadiz Province and specifically Alcornocales Natural Park are the destination of so many Spaniards and others in the know. In a country that counts "senderismo" among its favourite weekend pastimes, the hiking trails that start at our gate or within an easy drive, are some of the best anywhere. We will happily suggest a few, from those that require little more than a pair of sneakers to others aimed at a greater level of ambition. There are multi-lingual guides for hire if you fancy a less marked route. If organized sport is more your thing, the south of Spain is famous for its love affair with golf and one of the best known courses, Valderrama, which hosted the Ryder Cup a few years back, is a half hour away. There are high quality tennis courts for hire as well as one or more public courts in most of the nearby towns. Due south of us, on the coast, is Sotogrande, an important destination on the polo circuit. El Diplomatico Feo is also a wonderful base for easy day trips on great roads that feature some of Andalucia's best mountain views. The city of Cadiz (Europe's oldest argue many historians), Jerez de la Frontera (sherry bodega tour a must and/or drop in on a training session for the magnificent Andalucian horses), Ronda with its dizzying gorge, Gibraltar or just a lazy day meandering along the Mediterranean or Atlantic coasts. We are also an easy jumping off point for the ferries to Morocco (or satisfy yourself with a view of the African coastal mountains from our terrace). Did we mention the wonderful 2-3 coach train that goes by the back of our property twice a day? Leave your car with us, if you wish, and get on board in San Pablo to go to Granada or the coast and all points between. We can heartily recommend all of the above but will not hesitate in saying that there is also little better than a lazy few hours spent walking the charming streets of our town of San Pablo or its big sister around the corner, Jimena de la Frontera. The inhabitants take enormous pride in their history and go to great lengths to ensure a warm welcome to visitors. El Diplomatico Feo is, first and foremost, our home, and we are confident that the features that attracted us the first time we saw it will have the same effect on you. It is set in 30,000 square metres of fruit trees and meadow and boasts wonderful 360-degree vistas and dramatic sunrise and sunset. 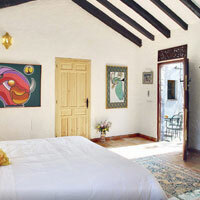 For our guests, we offer four large double rooms with king or twin beds and air conditioning. All have new or extensively updated en suite washrooms and one of the rooms is fully wheelchair accessible. All have individual outside entrances onto private terraces as well as easy access to a larger terrace and the pool area. We have wifi and a large screen television for those must-see football matches but if you prefer to be disconnected for a while, we can also commend to you our 3,000 volume library. Rates include breakfast for two and access to an honour bar. For other meals, there are three good restaurants just a 15-minute walk (or we can lend you a bike) away in San Pablo. An easy seven kilometre drive to Jimena gets you four or five more. 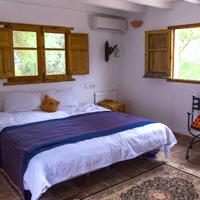 Rate: 95 euros per night for a double room (tax incl) and breakfast for two.